The importance of Arkadii and Boris Strugatskii in Soviet science fiction has been thoroughly examined. A less-explored question concerns how they have continued to inspire post-Soviet authors who muse on an environment that differs drastically from the one that gave rise to their works. Sofya Khagi explores how prominent contemporary writers—Garros-Evdokimov (Aleksandr Garros and Aleksei Evdokimov), Dmitrii Bykov, and Viktor Pelevin—examine the Strugatskiis to dramatize their own darker visions of modernization, progress, and morality. 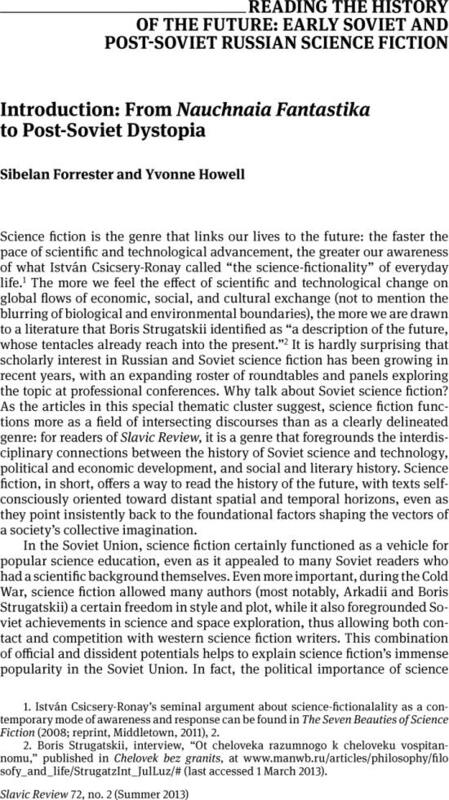 They continue the tradition of science fiction as social critique—in this case, a critique of society after the collapse of socialist ideology with its modernizing projects of historical progress, technological development, and social improvement. According to their parables a contrario to the Strugatskiis, the dreams of modernity embodied by the classics of Soviet fantastika have been shattered but not replaced by a viable alternative social scenario. As they converse with their predecessors, contemporary writers examine stagnation, not just in post-Soviet Russia, but in global, postmodern, commodified reality.